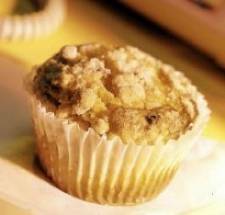 These delicious muffins are topped with a sweet and buttery "streusel", and ground nutmeg is added to the batter for a lovely "spiced" flavor. Muffins are best eaten warm right from the oven. Preheat oven to 400°F (200°C). Grease or line a 12-cup muffin pan with muffin liners. Combine the 1 1/3 cups flour and the brown sugar in large bowl; cut in butter with pastry blender or fork until mixture resembles coarse crumbs. Reserve 1/2 cup for streusel topping. Add all muffin batter ingredients to remaining streusel mixture in same bowl; stir just until moistened. Spoon batter into greased or muffin lined muffin pan. Sprinkle muffins with reserved streusel topping. Bake in preheated oven for 18 to 22 minutes or until lightly browned. Let stand 5 minutes; remove from pan. Substitute buttermilk with 2 teaspoons vinegar plus enough milk to equal 2/3 cup. Let stand 10 minutes. These muffins are really a hit, people ask me for the recipe all the time. They are quick, easy and tasty! We made these in my lifetime nutrition and wellness class and everyone loved them! I've been looking for a recipe that tasted like it and this was the first i found that was exact! Thank you for the awesome recipe!